Crab and tomato go together like cats and random things tossed onto the floor. 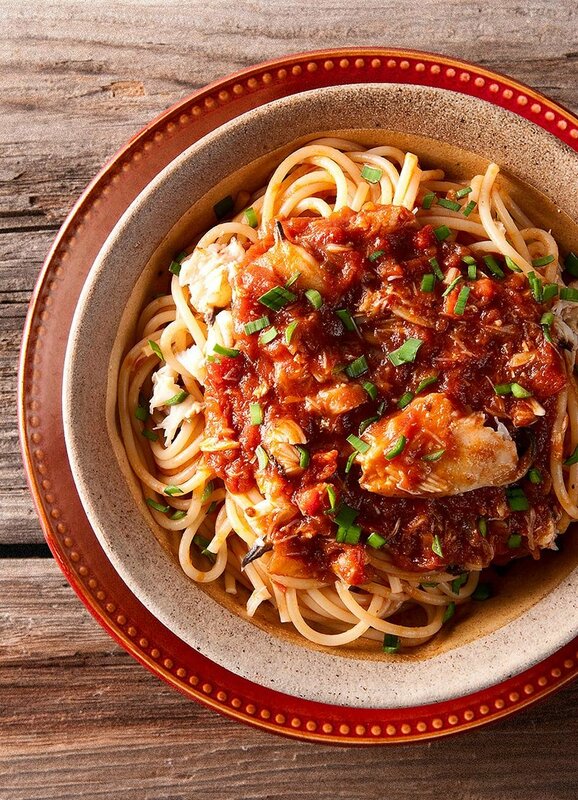 That is to say that crab and any form of tomato play well together, from a simple salad with freshly chopped tomatoes to this spaghetti with crab sauce. I first had a version of this dish several years ago; my brother-in-law Mark made it with lobster while I was visiting them in Massachusetts. It is a sauce of two parents: Italians and thrifty Yankees. Mark being both, he made the sauce using just the legs and bodies of the lobsters, parts many people throw away. But Mark knows that plenty of meat lurks within lobster bodies, and he’d patiently pick it out before making this sauce. As he did so, it occurred to me that there would be no reason why it would not work with crabs, too. After all, crabs and lobsters are cousins. So when I returned home to California all those years ago, the first time I brought back some crabs from Bodega Bay I made my own rendition of Mark’s lobster sauce. I’ve made it many times since then, and a version of it appears in my book. But as with any recipe you do over and over and over again, I’ve tinkered with the original, and, I think, have managed to streamline the recipe even more. In the old version, I had trouble getting all the shell out of the sauce. I’ve fixed that here. This sauce is insanely good. Good in the way only years of tinkering can do. Sharp, sweet, garlicky, just a little spicy with a strong hit of anise flavor from fennel and ouzo. 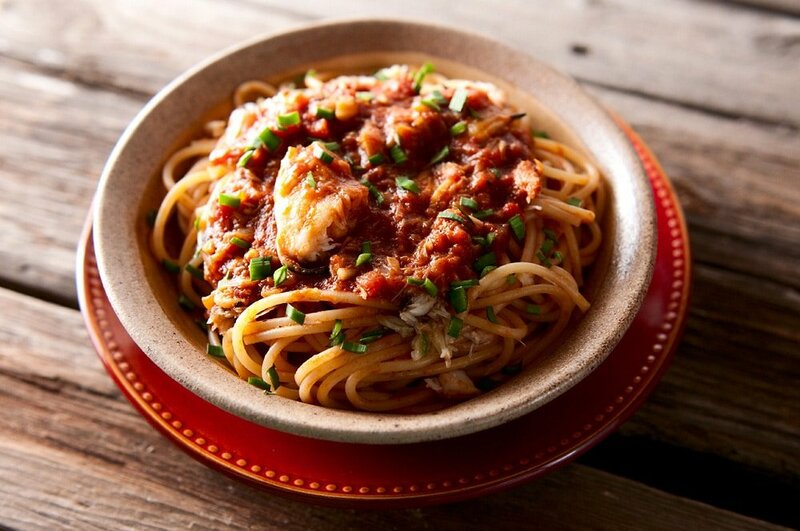 It may look like just a regular tomato sauce with bits of crab in it, but it’s not. I assure you. This recipe is a two-step process: Making the sauce base and then the sauce itself. You can make the base a day ahead if you'd like. Any crab will do here, but I use a combination of red crabs, rock crabs and Dungeness crabs. The only tricky ingredient here is ouzo, which is a Greek anise-flavored liquor. Most liquor stores have it, but you can sub in sambuca, raki, Pastis, Pernod or any other anise-flavored liqueur. Still can't find it? Go with brandy; that's what my brother-in-law does. To make the sauce base, put the onions and olive oil in a stockpot and cook, stirring occasionally, over medium heat until the onions are soft and translucent, about 6-8 minutes. Add the crab shells and the garlic and stir to combine. Use a potato masher to smash the crab shells into small pieces. Cook, stirring often, for 5 minutes. Add the bay leaves, the tops from the fennel bulb, ouzo and a healthy pinch of salt. Add enough water to cover everything by 1 inch. Bring to a simmer and cook for 1 hour. Turn off the heat and pick out as much of the solids as possible, making sure you save the liquid. Strain the liquid through a paper towel set in a colander. Reserve. To finish the sauce, heat the olive oil in a Dutch oven or other large, wide pot over medium-high heat. Saute the onions and chopped fennel until they are soft and translucent, about 6-8 minutes. Add the garlic and cook another minute. Mix in the tomato paste and cook for 3-4 minutes, stirring often, until it darkens and turns the color of brick. Add the ouzo, the tomatoes and 2 cups of the crab sauce base. Stir well and bring to a simmer. Taste for salt and add the Tabasco to taste. Simmer uncovered for 30 minutes, stirring from time to time. Boil your pasta. 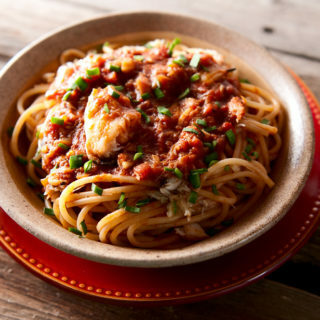 Once the pasta is ready, add the crabmeat to the sauce and stir gently. Mix the pasta with a little of the sauce, then portion it out. Top with more sauce, and garnish with chives or parsley. Once you make this sauce, it will last up to 3 days in the fridge before it starts to get funky. 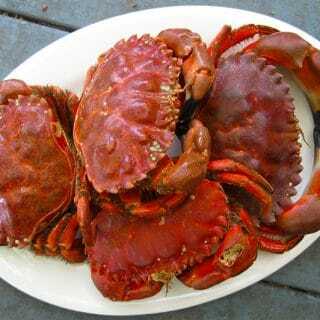 You can find all kinds of recipes for crabs and other shellfish here on Hunter Angler Gardener Cook. Also curious if other herbs (oregano, basil, capers) go well with crab. Like a substitute for fennel. Great post and hope to catch more crab! Eddie: Because it tastes better.